Arrival at TIA in Kathmandu. Transfer by our tour officer to Hotel Shanker for overnight. Early morning breakfast and then drive to the raft put-in point on the Trishuli River (approx. 4 hours). 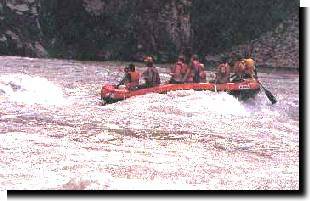 Start rafting with river guides. Lunch on river bank then proceed for another three hours to your camp site on the river bank. Dinner and overnight in tents. After breakfast, commence rafting on the Trishuli River until lunch time. After lunch a 3 hours drive to your safari camp in the Royal Chitwan National Park. Dinner and overnight. Day 4 Whole day jungle activities with lunch, dinner and overnight. After breakfast, transfer to Bharatpur for your return flight to Kathmandu. Upon arrival, drive to the mountain resort of Dhulikhel. The eastern Himalayan ranges can be viewed from here. Dinner and overnight. Return to Kathmandu. En route, sightseeing tour of Bhadgaon, Boudhnath Stupa and Durban Square. Dinner and overnight at Hotel Shanker. Early morning Mountain Flight (optional). Rest of the day at leisure. Dinner and cultural programme hosted by Times Travels & Tours.